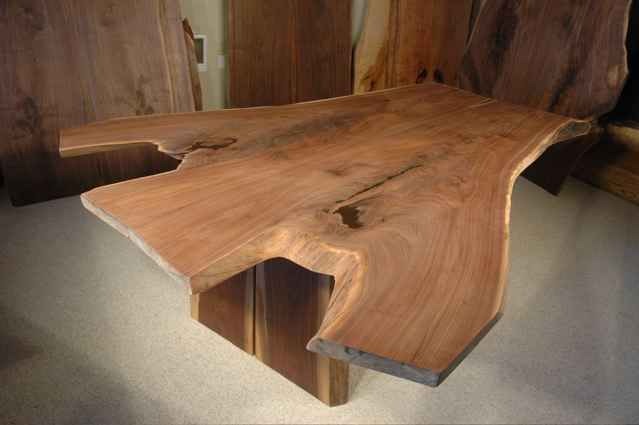 Custom Handmade Wood Slab Conference Tables with beautiful natural edges and organic shapes. These custom conference tables are handcrafted from EXCEPTIONAL HANDPICKED WOODS!!! When only the BEST will do!!!! Find the perfect piece for your office today!!! LARGE, Unique, unusual, handmade, walnut custom conference tables made to order from unique natural edge and live edge wood slabs. Book matched custom corporate conference table using walnut slabs top with matching slab trestle base. Ready to be made into a Large table. LARGE, Unique, unusual, Bubinga Slab custom conference tables made to order from unique natural edge and live edge wood slabs. Custom conference room table using Bubinga slab top. Claro Walnut custom conference tables made to order from unique natural edge and live edge wood slabs. 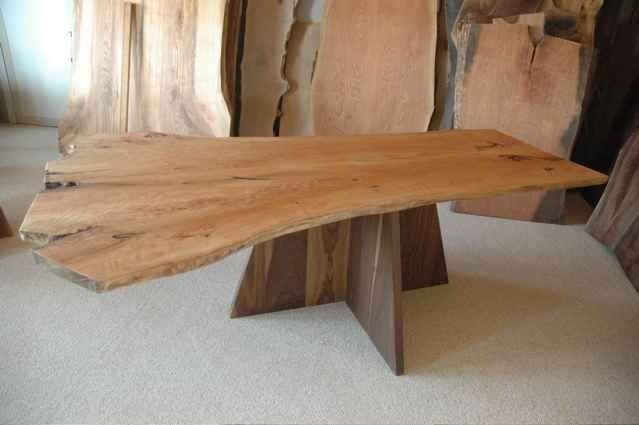 This table features a slab of Claro Walnut from an exceptionally large tree. Contemporary Burl Claro Walnut executive table. 9.5′ L x 34 – 40″ W x 2.375″ Th. Natural edged and cut edges, single slab Burl Claro Walnut slabs make this beautiful executive table unique. The grain in the walnut is amazing. The base is walnut. 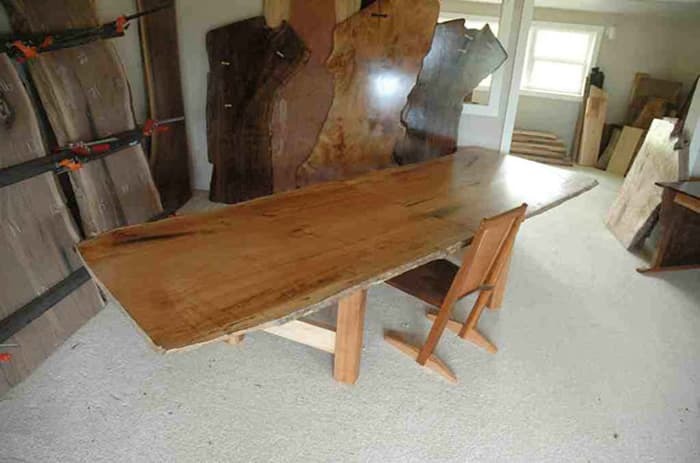 11′ Bookmatched Recycled Maple Slab Conference Table. We carry many different styles of unique custom conference tables. Call today for more info! 8.5′ x 43″ Wide Walnut Slab Custom Conference Room Table with Curly Maple Center. 8′ Ash Slab Conference Table With Double Walnut Pedestal Base. Custom Curly Cherry Crotch Slab Conference Room Table with Walnut Pedestal Base. Approximately 8′ long x 58″ wide. 10.5′ x 36″ wide- Cherry and Walnut Custom Conference Room Table. Can Make Another Similar and we do have many custom conference tables in stock. Are you looking for a company that can provide you with custom rustic conference tables? You may have a major corporation where you will need to have one designed. If you have gone to stores that sell conference tables, but you have not found one to your liking, you might want to consider working with a professional business like Dumond’s Furniture. Here is a quick overview of this company, the products that they produce, and why you should consider working with this business that makes some of the best custom conference tables in the world. There are several reasons that people choose to work with this company. First of all, they are very unique in that they use solar power for all of their business operations. They are literally off of the grid, powering all of their tools at their wood shops with solar energy. They also specialize in using recycled, repurposed, or salvaged wood that can help the environment. They have over two decades of experience in making furniture, and offering one year warranty on everything that they create. They only use seasoned wood, most of which is going to be cured for five years or more. Everything that they do is made in the USA. Each order that is placed is handled individually, allowing them to create handcrafted furniture that is made one piece at a time. You will be able to speak with a representative of the company to tell them what you want, and also talked directly to the master craftsman that will be taking care of your order. You can also get references if you need them to verify the reliability of the company. They are always concerned about not only current customers, but those they have helped before, and new customers that will come their way based upon referrals. Every piece of furniture that they do is considered a priority, allowing them to use their expertise to create something that is perfect for you. This is a business that has been producing custom furniture for over 25 years. They specialize in creating custom wood furniture that they ship worldwide. 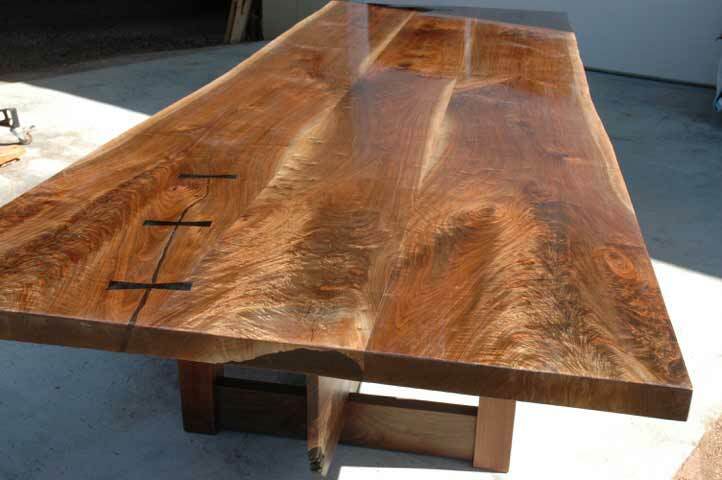 They are able to produce what are called live Edge conference tables which are very popular. They can also do dining chairs, all built to your specifications. They are also experts at building custom wood slab tables which will look very good in not only a conference room, but in elegant homes that need to have something unique. They also specialize in creating chairs, desks, beds, stools, and a multitude of other different types of furniture including custom tables. 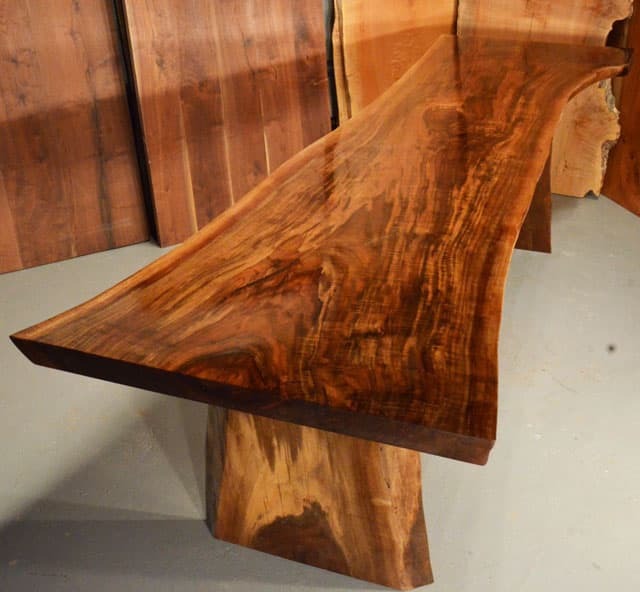 These office tables that are very unique because you can actually see the profile of tree that is used for each piece that is made. They will individually be chosen, evaluating the grains of the wood slabs that are used, specifically looking at the texture of the wood as well as the quality of the lumber that is used. Instead of regular conference tables that have synthetic layers on the top to mimic actual grains of wood, these are authentic pieces of wood that will display the grains prominently. What is unique about live edge conference tables is that they can go with literally any type of office decor, making them one of the more versatile types of conference tables that you can purchase. Dumond’s Furniture specializes in making these particular types of corporate tables, influenced by Shaker and Nakashima designs. The main reason for purchasing these particular types of tables is not just based upon how they look. The way they are crafted, they are designed out of a single piece of lumber that is handpicked in most cases. This will ensure that they will last for decades once the table has been completed. Live edge also reflects a sense of elegance and wealth, something that you will probably want to have on display as you are entertaining new clients. Best of all, your purchase will likely last the life of your business, and long after you have sold your business to a subsequent buyer. When you hear people referred to natural edge conference tables, they are referring to tables that are typically made of a single slab of lumber. These are enormous trees that have been cut laterally, revealing the grains of the wood as they have naturally developed and grown with the tree that is being used. These are also called live edge tables, so when you see advertisements from companies that sell this particular type of furniture, you will know what to expect. Many people choose to work with companies that use large pieces of lumber so that they can have this unique effect with every table or conference table that they have specifically constructed for their home or business. Slab conference tables are the same as live edge tables. They are created from a single slab of lumber. When you see large trees being delivered to a lumber company, when they are processed in a large log mill, they are cut lengthwise at a certain width and depth. Once you have purchased this type of furniture for your business, this is something you will always want to have if you purchase any additional tables. In fact, slab tables tend to be the top choice with major corporations because of their longevity and also the way that they look. If you have never ordered a custom table for meetings, you will be pleasantly surprised with the workmanship that you will receive from Dumond’s Furniture. This is one of the top companies in the world that produces furniture that is constructed with single slabs of lumber, allowing you to benefit from their appearance and how sturdy the tables will be over time. If you would like to make an investment that will last for decades, specifically into custom live edge or slab conference tables, this is the company you should call. Providing their services for 25 years, you cannot go wrong with this industry leader that specializes in natural edge custom conference tables and even reclaimed wood.